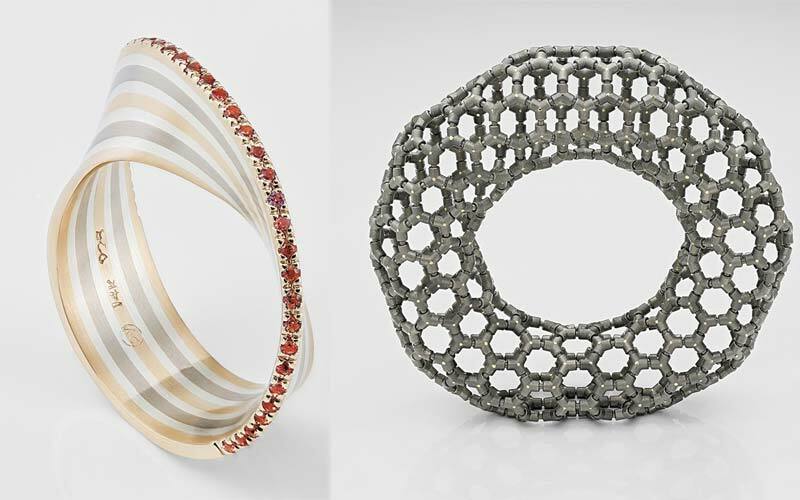 Pierre-Yves Paquette’s ‘Moebius No.1’ and Ezra Satok-Wolman’s ‘Torus Bracelet for an Astronaut’ have been named finalists in the 2019 Saul Bell Design Award competition. Two Canadian designers are among the finalists for this year’s Saul Bell Design Award competition. Now in its 19th year, the international awards program, organized by Rio Grande, recognizes artists and students who challenge traditional perceptions of jewellery design, creating pieces that are both beautiful and technically impeccable. The Canucks, Pierre-Yves Paquette of Saint-Jerome, Que., and Ezra Satok-Wolman of Caledon, Ont., are two of 45 finalists, hailing from 19 countries worldwide, selected from hundreds of entries. They are finalists in the gold/platinum and alternative metals/materials categories, respectively. Two ‘emerging artist’ awards will also be distributed, recognizing a designer 18 years old or younger (high school) and 22 years old or younger (college). Winners will be announced at an awards dinner on May 19 in Albuquerque, N.M.
To see a complete list of finalists, click here.